Oh hey, hi! Happy Thursday!! I’m pretty excited today because 1) I have this incredible recipe to share, 2) it’s finally time to start talking Thanksgiving things and 3) it’s Thursday, which means it’s almost the weekend!! 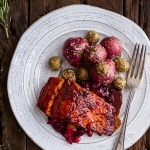 First, I am just going to put it out there that my goal for this post is to stick to the recipe because it is SO good that it truly needs to be the one and only focus of this post. OKok and for some reason I feel like I have done way too much talking this week. All of my posts the last three days have been well over a thousand words… and well, I am fearful I’m going to bore the heck out of you guys with all the current thoughts that are running through my brain. Can you say cookbook stress, holiday recipes, the family Christmas gift exchange (wait, what??? ), the little brother competing halfway across the world in snowboarding (for real, I mean, he’s only 16! ), the fact that we have zero snow here and it’s November 3rd…it did snow Tuesday night but Wednesday was beautiful and it all melted ?. Ahh yeah, I’m basically a basket case, I know it. 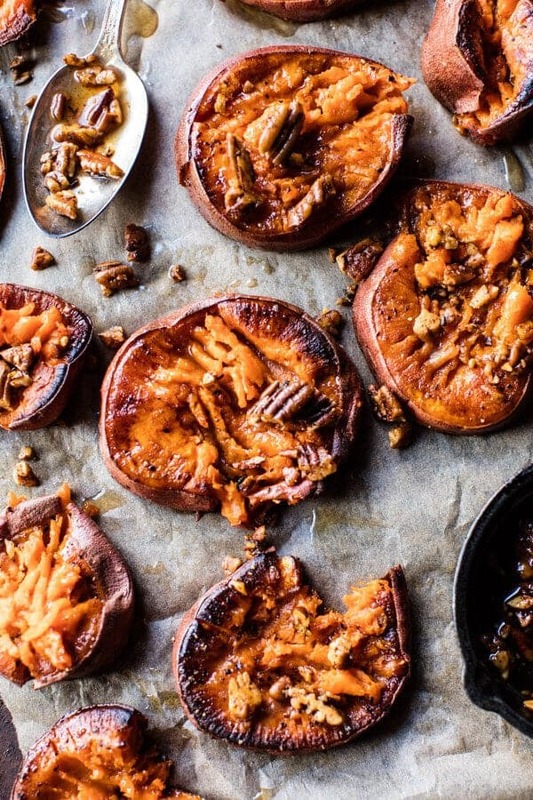 Sooo, let’s just talk all things sweet potatoes. Sound good? k. Cool!! 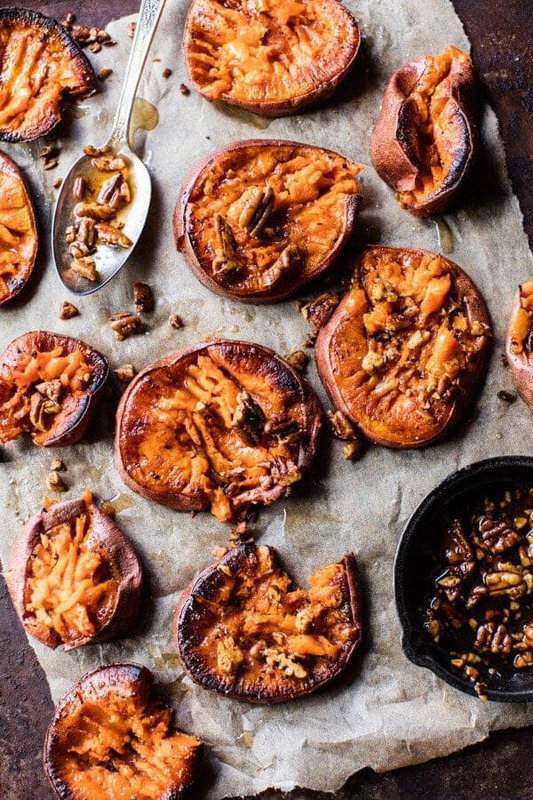 Guys, in all honesty, these might just be one of my most favorite sweet potato recipes ever. Like they may even beat my mom’s sweet potato casserole, which is saying a lot. These are just mouth wateringly delicious. I’m talking melt in your mouth, eyes rolling back, can I please have another, kind of good. YES, for real, no messing around. Here’s what I did, I took the idea of sweet potato casserole and simplified it a bit into these cute little smashed sweet potato rounds. 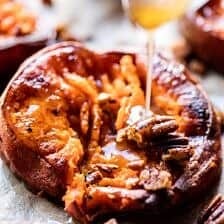 What I love is that instead of having a creamy consistency, like traditional sweet potato casserole, these little rounds have great texture combined with amazing flavor. Leaving the skins on allows them to get all nice and crispy in the oven, it’s truly the best thing ever. I’m the type of person who LOVES skins, maybe not in my mashed potatoes on Thanksgiving Day, but any other day I am all about leaving the skins on. They add texture and flavor and I just love um. So clearly, these sweet potatoes are my kind of thing. And while they are good enough on their own…roasted with a little cinnamon and vanilla, I went a step further and added BOURBON MAPLE BUTTER. Yes, yes, YES. If you do not drink alcohol that’s no problem, just leave the bourbon out, this is really all about the maple and butter. Oh my gosh, so freaking ridiculously good! Fair warning, these pint-sized taters are sweet, but in a really good, really perfect, and oddly savory way. Plus, it is Thanksgiving, we’ve been planning for this meal since…last year? And I just think that sweet potatoes are one of those recipes that need to be kept on the sweet side. Although, that does not mean these would not be perfect for any other day of the year, because trust me, I will be making these at least throughout the winter. 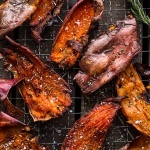 So here’s how these crispy roasted sweet potatoes with bourbon maple butter go down. First off, trust me, this is a million times easier than any sweet potato casserole you may have plans to make, and ahh, these are probably way better too. Just sayin’. 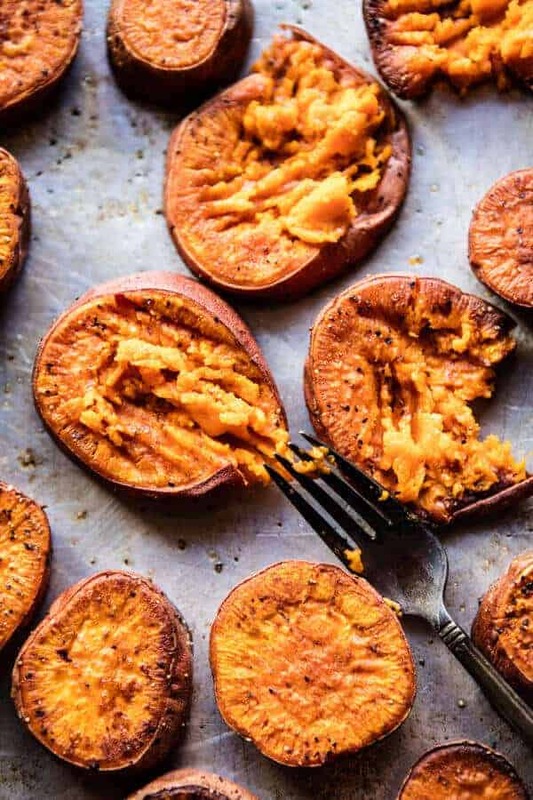 Alright, so you roast your sweet potatoes, give them a light smash with a fork, so that you can flatten them just slightly and allow for some of the sweet potato to get a little crisp, then drizzle on a little of that bourbon maple butter and then roast a little more. In the meantime, toast up some pecans with a hit of cayenne – to balance out all the sweet. Then sprinkle on the pecans and serve, drizzled (heavily if I might suggest) with that maple butter. Eat, then maybe forget a little about second helpings of turkey and instead go back for these most delicious sweet potatoes! <–yes, the would be me…and my mom for sure. 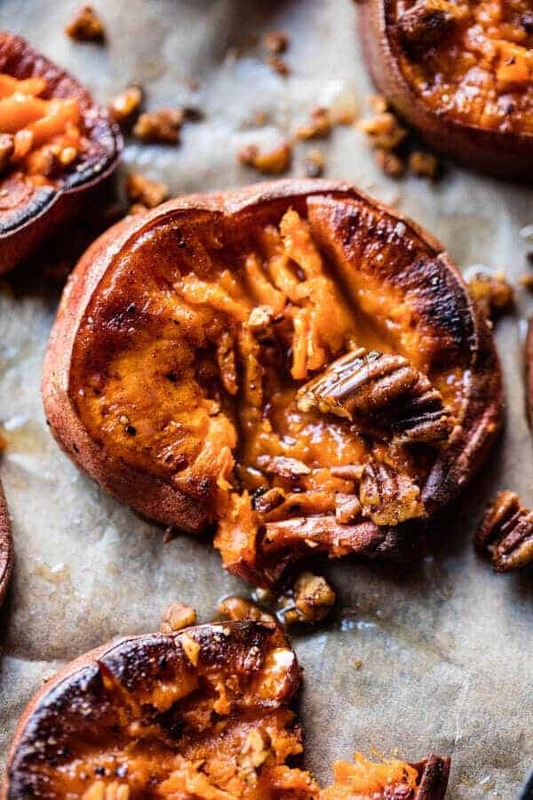 Oh um, I’ll just have a little sweet potato with my bourbon maple butter…cause it’s Thanksgiving, and we can. 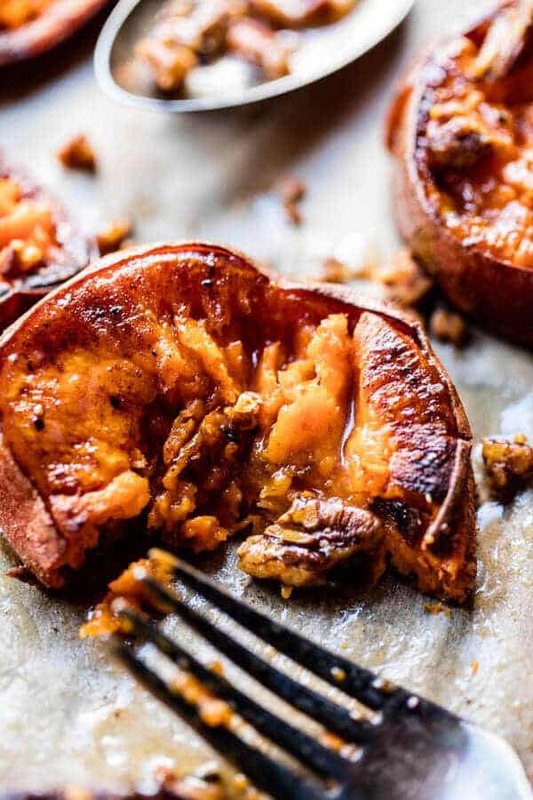 Smashed Sweet Potatoes with Bourbon Maple Butter. 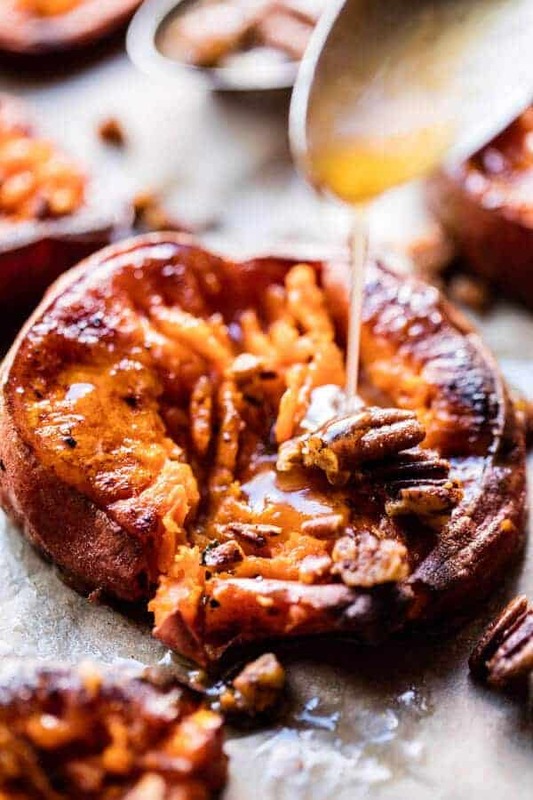 A sweet potato casserole, but simplified into these cute and delicious little smashed sweet potato rounds. 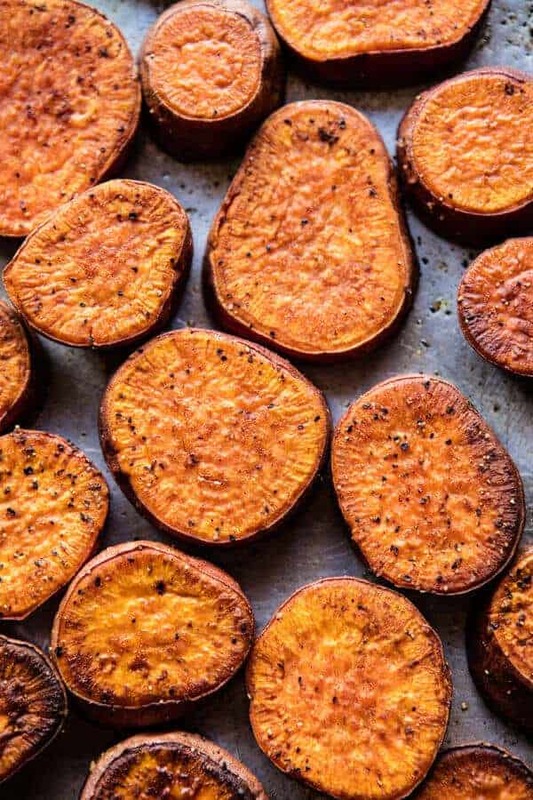 On a baking sheet, combine the sweet potatoes, olive oil, 1 teaspoon cinnamon, 1 teaspoon vanilla, and a pinch each of salt and pepper. Arrange in an even layer and transfer to the oven. Roast for 20 minutes, flip and roast another 20-25 minutes, or until the potatoes are tender. Meanwhile, melt 1 tablespoon butter in a large skillet over medium heat. Add the pecans, cayenne, and remaining 1/2 teaspoon cinnamon. Cook, stirring often until the pecans are toasted, about 5 minutes. Remove from the heat set aside. In a small sauce pan set over medium heat, combine the remaining 6 tablespoons butter, the maple syrup and the bourbon. Bring to a boil and then reduce the heat to low, simmer 5 minutes and then remove from the heat. Stir in the remaining 1 teaspoon vanilla. Remove from the oven and using a fork, gently push down and give the potato a light mash, keeping the potato round mostly intact. Drizzle reach round with a little maple butter and return to the oven for another 5-8 minutes or until the potatoes are crisp. 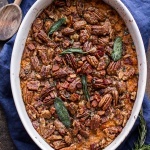 Serve warm, sprinkled with toasted pecans and the remaining maple butter along side. PS. The crispy edges? Game changing. These look absolutely INCREDIBLE! Such an inventive idea! Thanks! So happy you are loving these, thanks Rhian!! Oh my this and the Dutch baby–two awesome recipes. I’m just envisioning these as a little Thanksgiving appetizer with sponge candy. I have been looking for a side dish like this!! I’m not a seeet potato fan at all, but my guests are!! Thanks again for the amazing recipe! Perfect! I hope your guests love this one Cassandra! Thank you! Oh my GOD. Sweet potatoes are my favorite starch in the world. I eat so many sweet potatoes weekly, it’s frankly ridiculous. And maple. Maple is the best thing ever. This looks so wonderful. I have a spare bit of bourbon at home that is begging to be used! Yes! Super happy you love everything in this, because it is perfect for you! Thanks Jessica, I hope you enjoy! It’s definitely time to talk about Thanksgiving! I’ve been waiting for Halloween to pass before jumping to the holidays so it doesn’t seem like I’m too early. lol. These sweet potatoes look soo good. And bourbon maple sounds so perfect! Thanks so much Andrea! I hope you love this one! I am looking at your pictures and seeing yams, and I know that people confuse the two, or call them both sweet potatoes, so could you just confirm they are definitely sweet potatoes and not yams? (sweet potatoes are more yellow inside, yams are orange). Sorry to be so specific, thanks a bunch. These sound amazing, but I have a question. Your recipe calls for 2 teaspoons of vanilla. When you get to the maple butter you say “Stir in the remaining 1 teaspoon vanilla.” But I can’t find where the first teaspoon goes. Do you combine it with the olive oil, cinnamon, salt and pepper when roasting? Thanks! i tried to smash a sweet potato pre-cooking with a glass cup once; not a smart idea. using a fork post-cooking makes a lot more sense ? Haha that is great. I hope you love these Heather! Excellent says Craig all the way from Kolkata, India! Now to get my hands on sweet potatoes like these! Wow thank you so much! I hope you love this recipe, Craig! Thank you! What are your thoughts about leaving out the cayenne? 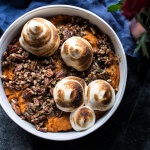 you had me at sweet potato, but it got better from there (i.e. – maple, butter, bourbon) plus skins-on! Thank you! Yes, well technically they are just consider cocktail glasses, but they would be great for wine too. Thanks! Thank you!! So happy you liked them! I can’t believe how good these look! Literally swooning. Sweet potatoes are my jam! Thanks for sharing! So happy you are loving them! Thank you Odessa! Oh my gosh! These look so so incredible! I can’t even imagine how delicious these would be with a dollop of creme fraiche! Yes! Thanks so much Maria! These look great! Do you cut the sweet potatoes long way in half? Or slices? These sound SO good! It’s making me so hungry! Definitely need to make these! I hope you love them Eden! Thanks so much! I’m wondering if I can make these a day in advance? Have you ever given that a try? I’m sorry to be dense but in your photo, the sweet potatoes are round, which of course, they aren’t when whole. So did you slice thick chunks so that a cut section is both lying on the baking sheet and facing up? Thanks! They look amazing! Thanks for the inspired recipes! I am looking forward to making the turkey soup you posted the other day as well after Thanksgiving! Ah yay! So so happy you guys liked them!! And that you are going to make them for Thanksgiving! Thank you Sarah!! So happy your liking everything Happy Thanksgiving!! ? Hi, I was wondering if slicing them @ 1″ instead of 1/2″ would work? I would like to have a little more potato per slice…and could I used vanilla powder? I have both but am always looking for ways to use it, the powder. (It’s just ground vanilla bean pods). Thanks! HI! Yes, I think 1 inch should be fine, but you will need to cook them a little longer. vanilla powder will be great! Let me know if you have any other questions and I hope you love these! Happy Thanksgiving! Thanks for the great recipes idea! Do you think the outcome will take the same if you use a yam instead of a sweet potato? Happy to say I made these today for thanksgiving and everyone loved them! They looked beautiful and tasted heavenly. Ah so happy to hear that Julie!! Thanks so much! These were amazing! Made them as a side for visitors yesterday and everyone loved them! They are soo good!!!! Yay so happy you liked them! Thanks Candia! I just made these to see if I wanted to serve them with Christmas dinner and was amazed how good these are even before the bourbon butter. Awesome recipe! Only changes I made were coconut oil instead of olive oil and I used a well seasoned cast iron grill. WOW! So happy you liked them Marcus! Glad the coconut oil worked well!! Sweet taters are my HOLY GRAIL. Seriously! I love it when they become slightly crispy on the edges but still retain their sweet softness in the middle of each slice! Made this today and they turned out really well. Next time I would try to find larger sweet potatoes as mine kind of fell apart when I flattened them. Also maybe use a larger pan as they didn’t get very crispy on the edges. Still tasted amazing AND we have enough maple bourbon butter left for pancakes tomorrow morning!! Win win! Perfect! I am so glad you enjoyed these Kathryn! Thanks! Hello! I have a quick question. Your recipe calls for “4 inch medium sweet potatoes sliced into 1/2 rounds” Is it supposed to be 4 pounds of medium sweet potatoes? Or are the sweet potatoes supposed to be 4 inches thick; and if so, how many sweet potatoes do I need? Also the recipe looks great, but I am not a fan of the mushy texture. Do you think I could cube them instead? Thanks! HI! So sorry for the confusion. It is 4 sweet potatoes sliced into 1/4 inch rounds. recipe is all fixed. If you don’t like mushy potatoes, then yes cube! That said it’s not that these are mushy. You might try them and then decide? We made these as a side dish for a dinner party and they were easy and delicious! Thank you! This is my new favorite food. Oh. My. Goodness. These are truly awesome. New Thanksgiving staple!!! Oh how I love this recipe!